Keep an eye on your little ones in the back seat, safely and conveniently. Like any parent, you like to check on your kids to ensure they're safe, as well as letting them know you're there for them. Especially on long trips in the car, your kids can get restless because they need to be reassured you're paying attention to them, but you need to keep your eyes on the road. Problem solved. Strap the Alphabets adjustable mirror to the rear seat headrest, and enjoy a wide-angle view of your little ones in their car seats. The PU leather is extremely Chic and Stylish. The adjustable attachment straps allow the mirror to securely attach to most vehicle head restraints. Its pivoting base let you set it to the exact angle to capture a good view of your baby. You'll be able to interact with your child without even needing to turn your head, keeping you both safe while driving. Drive Calmly with the Alphabets Back Seat Mirror which provides an expanded view of your baby and surroundings with the Extra-Large Wide angle. Our mission at Alphabets is to create infant and juvenile products that are safe, fun, creative and most of all innovative. Products that are used daily and become a highlight in a baby's early years. We strive to develop and introduce products that enhance the parent/child experience in a safe, fun, loving and positive way. PEACE OF MIND: The Alphabets infant rear-view mirror makes it easy to view your baby while sitting in the front seat or while driving. We Have also Included a FREE Baby- On- Board Sign to ensure Ultimate Safety! WIDE CONVEX MIRROR: Drive Calmly with the Alphabets Back Seat Mirror which provides an expanded view of your baby and surroundings with the Extra-Large Wide angle. 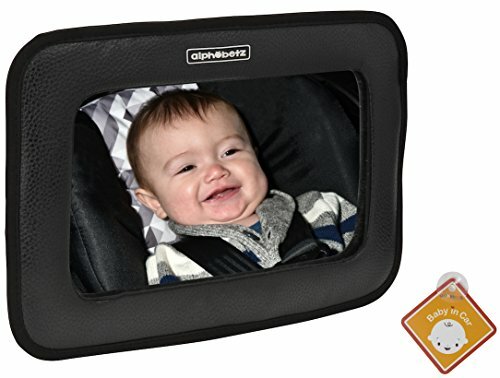 SAFE SHATTERPROOF MATERIAL: The Car seat Mirror's shatterproof Material ensures no harm is caused to your baby in the case of an accident. We have crash tested this mirror to surpass all US safety standards. If you have any questions about this product by Alphabetz, contact us by completing and submitting the form below. If you are looking for a specif part number, please include it with your message.